The leadership book club I belong to at work just finished a great read about innovating. 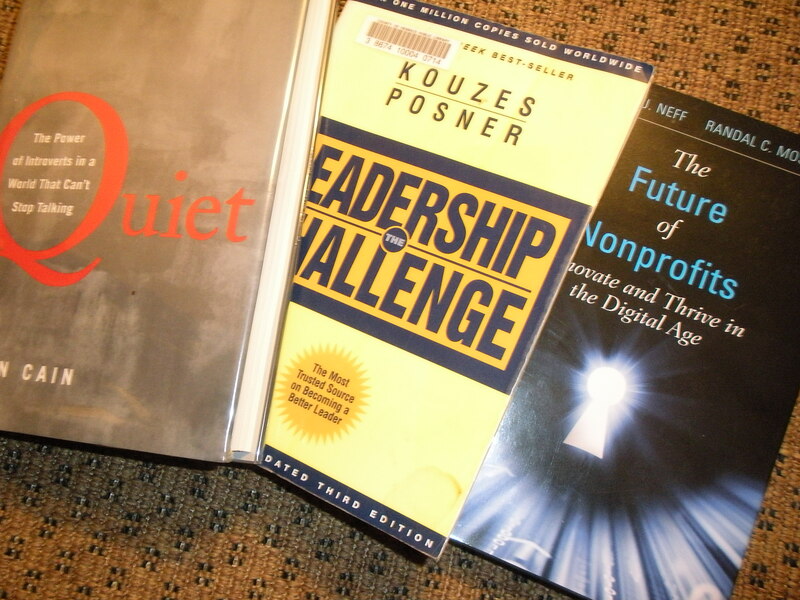 Next up is one about introverts succeeding in an extroverted world and then one on leadership. I always have found inspiration in leadership, management and self-improvement books, but the impact is even greater when I’m able to discuss the books with others. Quiet: The Power of Introverts in a World That Can’t Stop Talking by Susan Cain: “This extraordinary book has the power to permanently change how we see introverts and, equally important, how introverts see themselves,” notes the book jacket. I just finished reading a riveting suspense book called Gone Girl by Gillian Flynn. One of the characters has to be prepped for a media interview. The section resonated with me because of all of the media interviews I had to give as a spokesperson. In my current role, I do the same, just not as frequently, so I thought I’d brush up some on how to give a successful interview. Practice: Don’t think you can meet with a reporter (either print or video/digital) and expect to easily answer questions and succeed in the interview. In advance, develop a list of questions you expect will be asked. Then find someone to ask those questions of you and answer them out loud. That way you can determine how far off the mark you are and what you might not have an answer to. Don’t over practice, though, as you don’t want to come across as too polished. Answer the question and stop: A common mistake is for an interviewee to keep speaking to fill silence or gaps. Answer the question the reporter asked and then stop. If there is silence, don’t fill it. The reporter will quickly ask another question, especially if it’s for television, because the reporter won’t want silence. If you keep talking, you are likely to say more than you had planned to share. Be truthful: If the topic is difficult, you need to answer honestly. If you don’t, the reporter – and subsequently the audience – will know it. You will continue to be hounded until the truth comes out. If you don’t want to talk about a situation, then don’t agree to the interview. But be aware that a reporter will find someone else to discuss it, and that person’s version may be even less flattering. The character in Gone Girl prepped for the interviews and did well. If you follow these tips, you will, too. Are you like most people who visit websites on their computers while at work but after work, they view sites on their mobile? Why does this matter? If you are delivering targeted messages, you need to know where to deliver the messages. That’s one of the nuggets I learned from a digital advertising seminar series I recently attended. Michael Fibison, director of channel sales for Yahoo!, shared several insights with the participants. I thought I would share the ones that resonated with me. I don’t work in sales or advertising, but I do work in content and brand, and many of the items I heard made me think about how I do business. More than 90 percent of consumers are researching products online because it makes them feel more confident about their purchase, according to eMarketer. That means, I need to be sure to provide relevant content to my users, who will want to know more about the company and how it operates. I work for a nonprofit and transparency is key. While 9 out of 10 users on Pinterest are women, men who use it tend to purchase a product after discovering it on Pinterest, according to Fibison (37% men, 17% women). I started pinning the photos from my blog and saw an increase in overall traffic. I have not gone back to see the demographic breakdown but I was intrigued that more men are purchasing as a result of Pinterest. Don’t forget about video. More than 1 in 4 individuals spend 10 minutes watching videos on their desktop. If the person is on a TV or game device the number jumps to 60 percent. If you aren’t developing videos to sell your product or tell your story, you should be. I’m involved with a statewide mentoring organization and recently sat through mentoring basics. It struck me as I was listening, that many long-time members of NFPW would make great mentors to first-timers attending the conference. Even better, they could mentor a member who is new to their affiliate. A mentor is a trusted counselor or guide, according to one dictionary. It doesn’t have to be formal. I’ve had mentors throughout my career, and now I find myself mentoring others. When I meet with individuals, it is usually over dinner or coffee. Sometimes we’ll attend a local workshop together. I answer questions, suggest resources and introduce individuals to others whom they might find interesting. Why not take the time at the NFPW conference to mentor a first-time attendee? Invite the person to join you for a meal. Discuss the workshops you’ve attended. What was helpful? What wasn’t? Introduce them to other members. Talk about your involvement. Have you served on the board? Have you been honored in the communications contest? What’s the best part of membership for you? Contact them after the conference to see how things are going in their career or job search. I’m halfway through my month of self-imposed no television. Fortunately, the opening ceremony of the Olympics occurred in July. I may be the only person who was not bothered by NBC’s tape delay of the coverage since I didn’t watch any of it. I read about it in the morning paper, followed events on Twitter and learned of medals on Facebook. I didn’t miss the TV viewing. In fact, I’m not missing it at all. The first day or two was rough because my habit was to come home from work whatever the hour and turn on the television. I viewed it as background noise. What I didn’t realize is how much of a distraction it was. Without television, I’ve cooked more, read more and gone to the gym more. I also have enjoyed the quiet of my home. One of the books I’ve been reading is Cheryl Richardson’s The Art of Extreme Self-Care. Ironically, I’ve had it for a few years and now that I’m not watching TV, I have more time for reading. One of the chapters focuses on creating an “Absolute No List,” which is a list of activities that I won’t tolerate in my life. As a result of my experiment, I’ve decided I won’t tolerate using television as a distraction. What’s on your Absolute No list? Most people have an office in their home. I have a library. It’s a matter of word choice, but for me, it also sends a message. One day I will publish a mystery and my book will grace the library shelves. In the meantime, I write in my library surrounded by signed copies from some of my favorite authors, whom I have been fortunate to meet. There is Janet Evanovich, who at her book signing, spent a few moments giving me advice and suggested writing critique groups for me to seek out. There is Emyl Jenkins, who provided me with fairy dust, to keep my writing inspiration alive. Another favorite is Michael Connelly, whom I met at a mystery writers’ conference. I passed him in the foyer and said hello as if I knew him. Of course, I didn’t, I just felt like I did because I was familiar with his photograph on the back of his book jacket. It didn’t matter. He found a sitting area and spent a few minutes with me, also giving me solid advice. David Baldacci is another favorite. He always makes time for his fans, signing books and answering questions. Like the other authors mentioned, it doesn’t matter how many times he makes the best-seller list, he still is approachable and pleased to talk about his craft. So while I continue to write and re-write, I surround myself with the words – both on paper and in person – of other authors. And I leave space on the shelf for what I hope will be the first of many books I publish. What helps you write and where do you write? The other week I was visiting a smartphone kiosk and mentioned that I dislike carrying around all the cards to get discounts from various vendors. Next thing I knew I was addicted to the Key Ring app, which brings all the cards together on my phone. I can scan and store all of my existing loyalty cards (I have a ton!). I can even find ones that I might be missing. I’ve had a few glitches, but overall, I love not carrying all those cards. Or worse, leaving one at home! Grocery IQ: I don’t like grocery shopping so when a colleague told me about this one, I couldn’t wait to try it out. With this app you can make grocery lists, check off items as you pick them up in the store and set favorite products. You can even customize the aisle for each store you shop. Myfitnesspal: Another colleague told me about this one, which allows you to keep up with your exercise and food eaten during the day. It lets you know how many calories you should take in and when you are over or under. Even better, if I have exercised, it lets you have more calories! GasBuddy: If you drive a lot, this is the app for you. It allows you to check gas station prices and where the deals are in different cities. It also tells you how far to the next gas station. NFPW member Teri Ehreman used it when she was scoping places for next year’s post-tour trip. Waze: This is another great app if you are on the road frequently or just can’t stand traffic. As the site says, Waze is a “fun, community-based GPS traffic and navigation app.” Drivers report what is happening and you get turn-by-turn navigation that re-routes as road conditions change. DirecTV: NFPW Member Gwen Larson likes this app because she’s often running from the office to her son’s athletic event and will realize she’s forgotten to DVR a newscast with which she did an interview. With this app, she can set the recordings directly from her phone. What are your favorite apps and why?